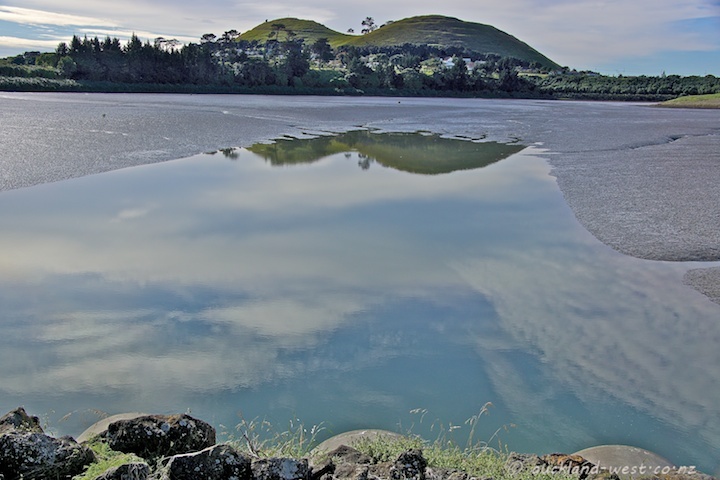 It was a grey afternoon, but perfectly still, hardly a ripple on the surface of the water in the bay by Kiwi Esplanade. 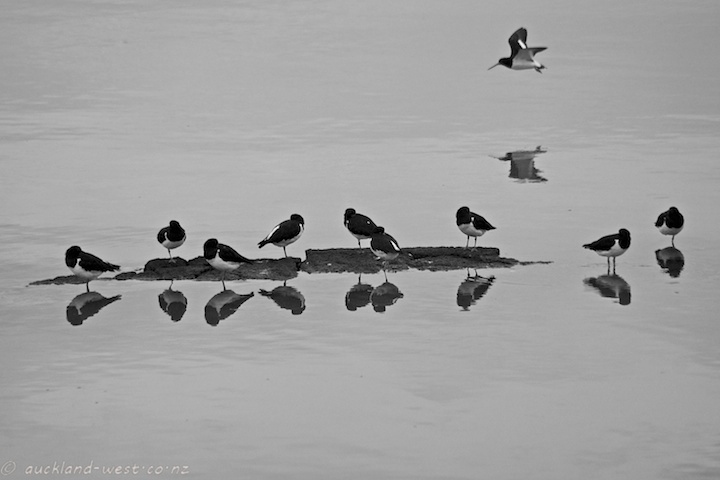 The oystercatchers had flown in, driven by the rising tide, from their feeding grounds in the mudflats of the Manukau Harbour. And now the tide was inching its way up the various outcrops of volcanic rock that they occupied. We had quite an abundance of rainbows of late — and plenty of rain, too. 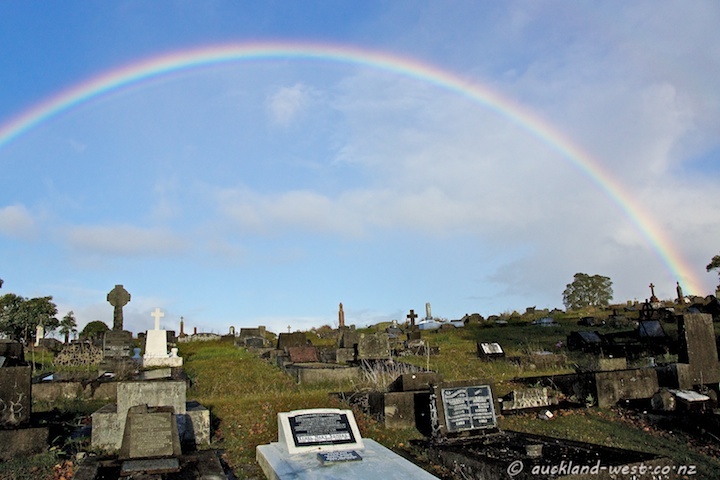 Here I was driving through Waikumete Cemetery when suddenly the rainbow formed. Note that it takes an extra wide angle lens (or panorama stitching) to capture the full rainbow. 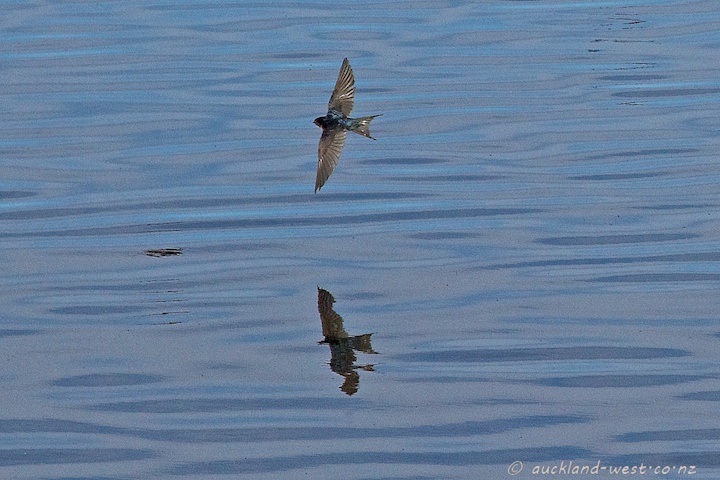 From one of my recent outings to Orpheus Drive. 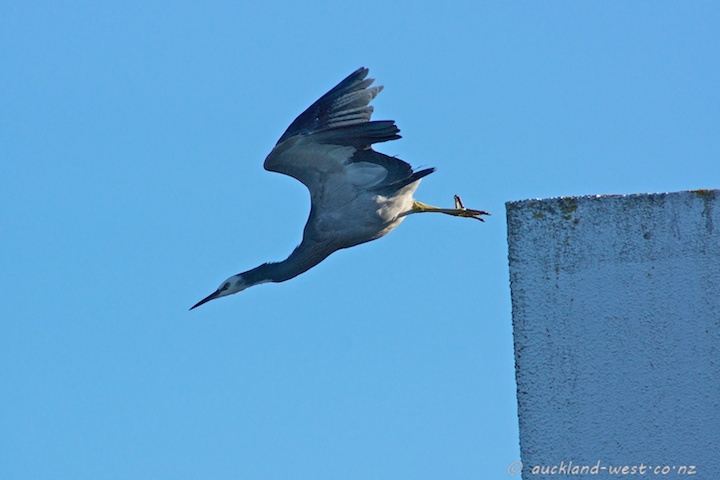 One of the white-faced herons had flown up to the top of the (two storey) Manukau Cruising Club. After enjoying the view for a while, it decided to re-join the rest of the flock, giving rise to these less than typical flight pictures. John Botica is a specialist in pebble sculptures. 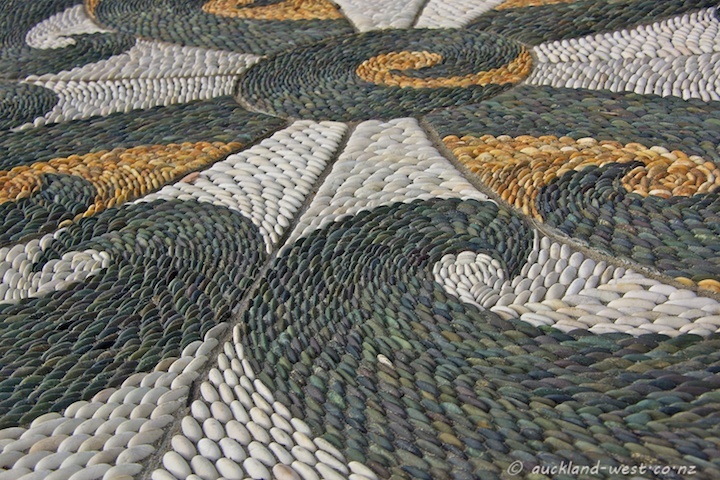 This work is in the courtyard of the Mangere Arts Centre — Ngā Tohu o Uenuku. The last picture shows it in context, with a stone sculpture by Filipe Tohi in the foreground. Koru is the Maori word for unfurling fern fronds. 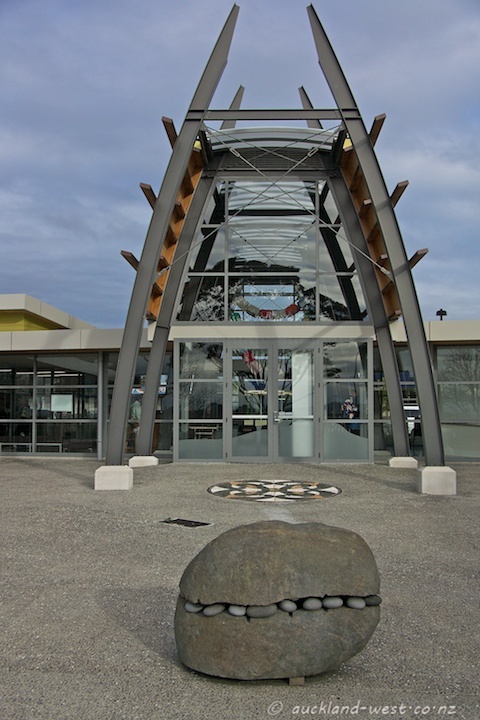 We have shown another work by John Botica (“Compass Rose” at the Harbourview Sculpture Trail at Te Atatu) on April 2. 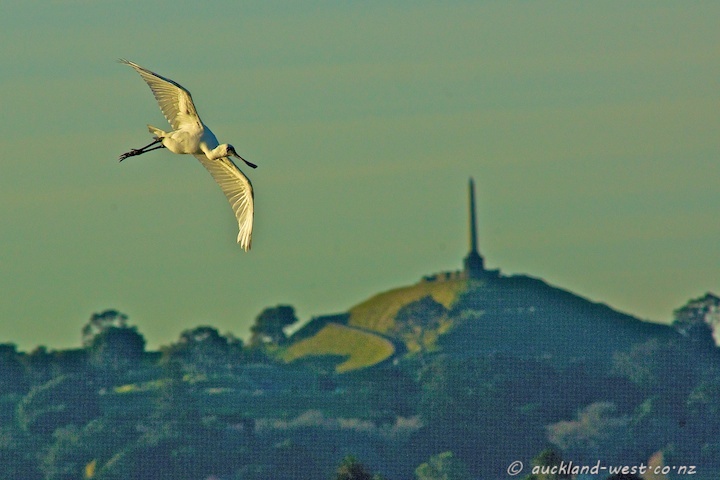 Still chasing birds, I caught this Royal Spoonbill from the bay at the Manukau Boating Club, Mangere, in the late afternoon sun. One Tree Hill in the background. 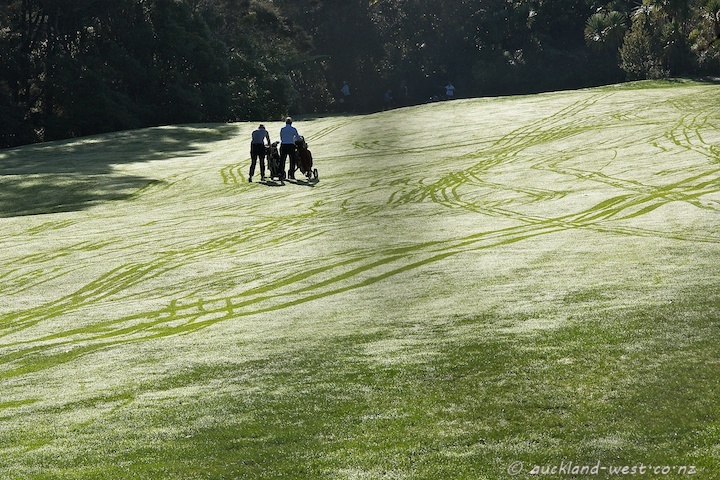 Signs of early morning activity at Titirangi Golf Course. I had a few moments to spare and enjoyed myself taking pictures of the streetscape. 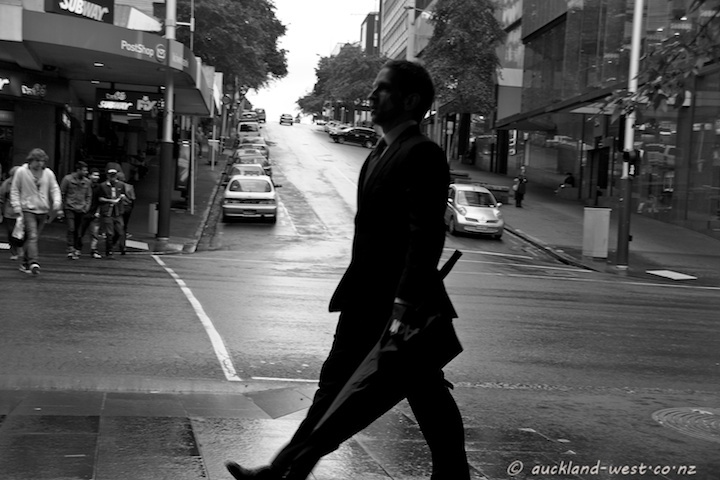 Queen and Wyndham Streets. 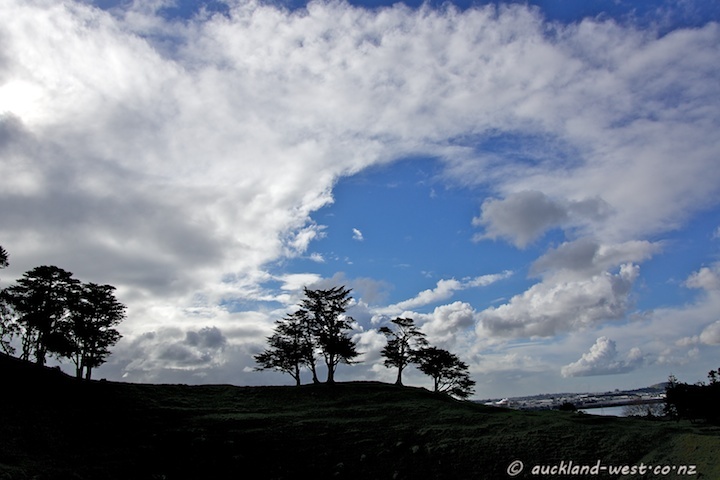 These interesting cloud formations dominated the sky above Mangere Mountain yesterday (shortly after the June solstice). The trees are on the rim of one of the craters. 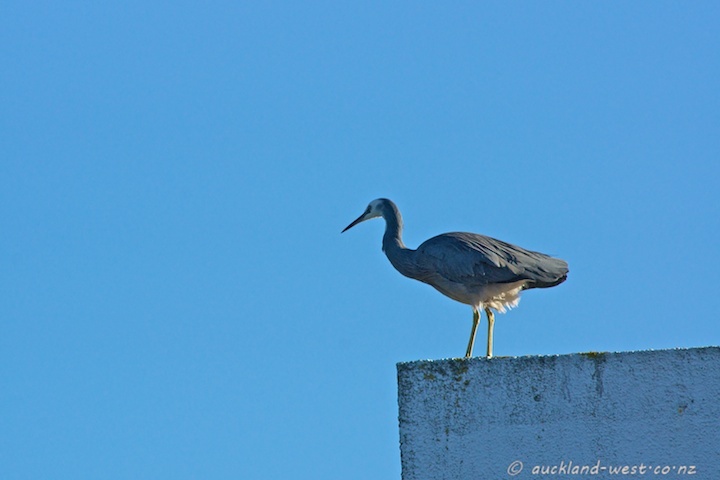 … does not make a summer, nor does a whole flock of them as I saw them next to Island Road, Mangere. 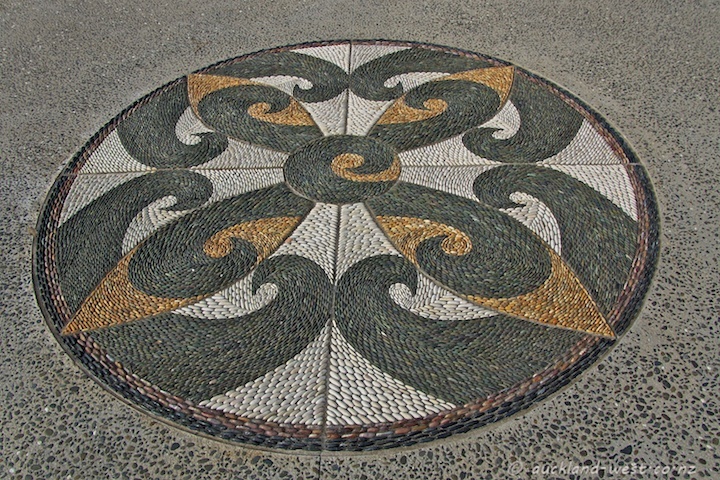 It’s the day of the June solstice (June 21, 2012 at 11:08 AM, NZ time), and we are on the wintery hemisphere. But the days are about to get longer, and Matariki festivities are taking place. 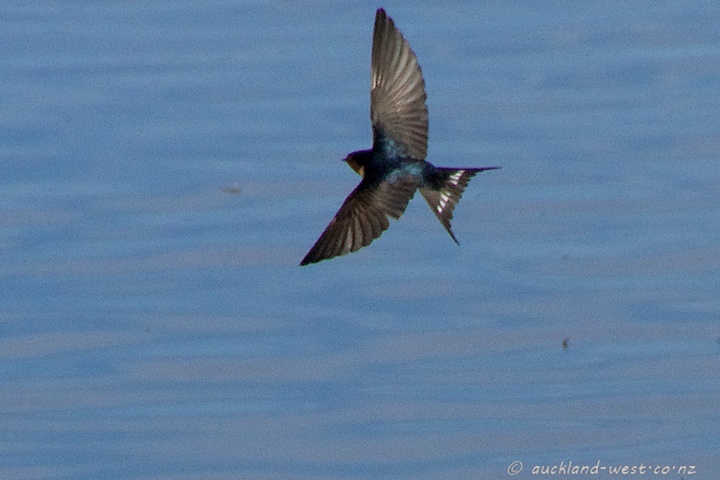 Reading up on Welcome Swallows (hirundo tahitica), I was surprised to find that the first records of these birds breeding in NZ are as recent as 1958. 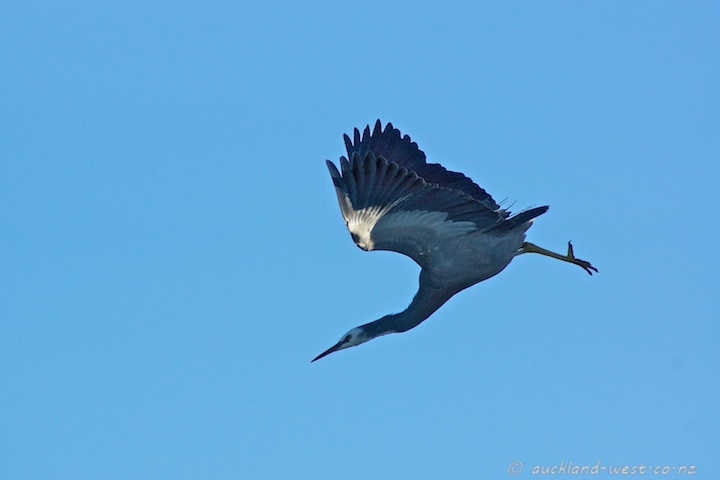 Now they are common birds, flitting over all waterways, certainly in the Auckland area.